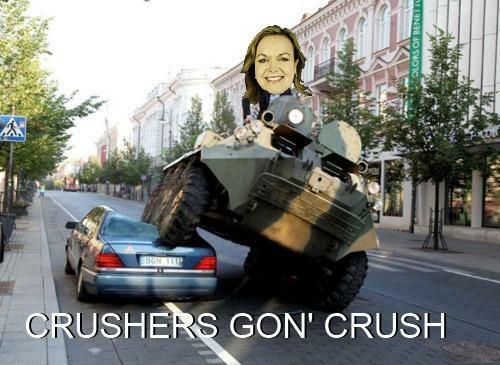 2 and a half years after giving herself the nickname ‘Crusher’, Judith Collins still hasn’t crushed a single boyracer car. Collins says the car-crush laws are working. Boyracers don’t want their cars crushed. So they don’t break the law. Convenient theory. Pity the stats don’t confirm that. Round my way, the record petrol prices cut the number of boyracers for a while. They’re back now. Crushless’s law was always just a stunt. Would have been a waste of cars if it had worked. An embarrassment now that it hasn’t changed a thing on the ground. Chrushless reminds me of Norm Kirk’s one embarrassing “loor ’n ordaah” move, the infamous “take the bikes off the bikies” and similarly do not recall one confiscated motor cycle nor any drop off in biker gang numbers. Some politicians just have to work for the clampdown rather than trying to increase people’s freedom. To be fair to big Norm though his government did support Ohu communities which were quite liberal for the times. She said that actually Labour gave her the nickname. She said 17 people are on their 2nd strike offence. 3rd strike and the car is crushed/sold. The legislation allows for crushing *or* selling of the cars. Probably the 1st one would be crushed as a PR event and after that I’d imagine they’d try to sell the cars where possible. evidence that Labour gave her the name? I’m just repeating what Collins herself said on the radio (Morning Report) a couple of weeks ago. oldest reference I can find is 3 Feb 2009 from Audrey Young, she also invented nicknames for Bennett and Tolley that didn’t catch. Revelling in “her” nickname doesn’t mean that she invented it. Just that it’s hers (and she likes it). and the angry noise brigade are back on the roads again. getting waremed up for the summer? or do they think the cops are going to ease up just because there is an election or something. or do they just figure if they have a choice to make a noise or not then they can get away with it with impunity because it is their choice. A circular argument I know but that is the logic of the peabrains on the roads now. show no mercy on these little turds who cant do anything but make a loud noise and dust their number plates at night to escape the law. Agreed! The noise drives me round the bend… and every time one of them hits the power pole at the end of the road, we have a power cut! Mercifully, it hasn’t happened for a while. My brother actually died as a result of hitting a power pole, it was a tragic accident and something that is happening more and more, attacking the symptoms with such initiatives like crushing cars, impounding them or anything else that has a perceived ‘tough on crime’ stance will not do anything except foster more resentment in young people. What needs to be addressed is the underlying cause, which is a lack of identity and ability to pursue hobbies due to large costs involved. If every town had a burnout pad where kids (I will call them that because thats what they are) could skid and doughnut to their hearts content it would help the matter for the cost of laying some concrete. Haha and I may just start a huge argument with that idea. But what the older generations forget all too easily (along with free tertiary education I might add) is that all of you guys were nutters with your anglias, zephyrs and so on, but times have changed, it is time we changed with them. My sympathies about your brother! I think you have a point about facilities for these ‘kids’ to use – but really speak for yourself about us having acted similarly! I don’t drive, but my brother, sisters and brothers-in-law never did ‘burn-outs’ and the like.. I hear the great sucking sound of an intellectual vacuum attempting to be filled….there goes the whole National cabinet. Crushingly vacuous. Vote them out? I know it seems simple but often the best answers are. Police and the courts already have the power to confiscate cars and charge a small fortune to have them released (or have them sold). Crushing cars is only red meat for the rednecks. Another quality ZETETIC graph, comparing apples to oranges. Or was the definition of a boy racer changed to anyone committing a traffic offence, including illegal parking?